Apologies for the time this file takes to load. This is due to the graphics of course. I borrowed a digital camera and the results are worth waiting for. 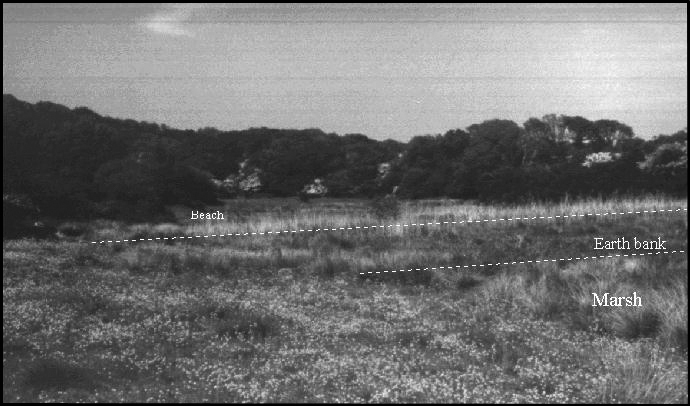 You will recall that some six years earlier I laid out the proposal that the inlet immediately adjacent to the landing site was enclosed by an earthen bank and this bank formed part of the necessary supporting evidence that the Normans landed at this site. This is detailed in Part 52, if you care to refresh your memory. One of the principal claims (in the Carmen - now re-established as probably authentic due to the work of Elizabeth Van Houtts of Cambridge) is that William earthed up his ships in order to avoid desertion by his men - a prudent move given the circumstances. If this is the true site of the Norman Invasion evidence of that event will still exist. 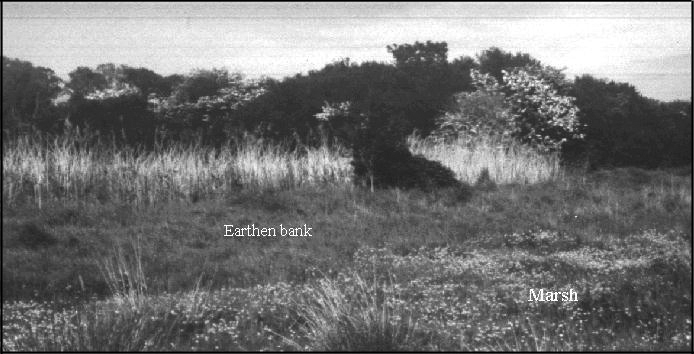 Hence the interest at that time in seeking to establish whether this earthen bank were man made in recent times or whether the unusual aspects of the construction could be attributed to a hitherto unknown distant link with the Invasion, which was subsequently adapted by the Victorians when they built the marsh drainage system in the mid 1800s. 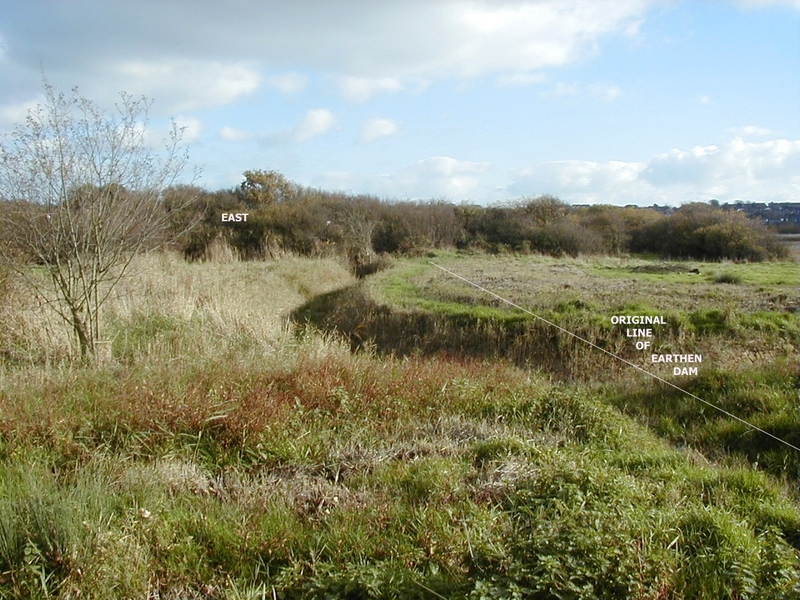 A drainage ditch was hidden in a deep reed bed. This cut through the left hand side of the inlet (looking North) along the inside of the bank. This is something that is illogical since a stream runs into the inlet and the effect of building an earthen dam across this is to keep water inside the earthen structure. Further the cut through the bank is on the shallow side of the inlet. This is not logical since engineers who knew the structure of the valley floor should have known that the eastern side of the inlet was twice as deep as the side which they put the cut through. 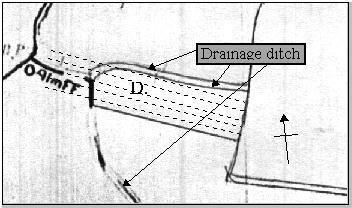 If they were the ones to form the earthen bank they would have placed the excavations on the marsh side, since the object was to drain the marsh yet in this case the decision was made to cut the ditch along the inside of the bank. My proposal is that this decision was made because the earthen structure was already there. Now as a result of recent developments I am convinced this is the case. At the time these photos were taken in 1993/4 the water levels were high on the marsh to the south. Analysis of this feature was almost impossible from an access point of view as there is no public point of access, with wide drainage ditches to the south out of view. These pictures were taken at the time. Looking north into Monkham inlet mid summer. The work was done in early summer and on the picture below the grey fleck flowers that are in the foreground at marsh level are in fact yellow buttercup type flowers indicating the marsh level. The reason I have returned to this feature is because I have been told by the farmer who lives at Wilting Farm that the ditches at the earthen bank site have been cleaned. Using major earth moving equipment I have been told that a large beam that appears to be oak was uncovered in the middle of the earthen bank. I therefore decided to investigate. It is interesting to see how much the valley floor has changed in the last four or five years. This is the view looking south out into the inlet in 1993. Here is a similar view today showing the reed beds have been completely decimated. The green grass area in the foreground runs up to where the earthen bank is located. 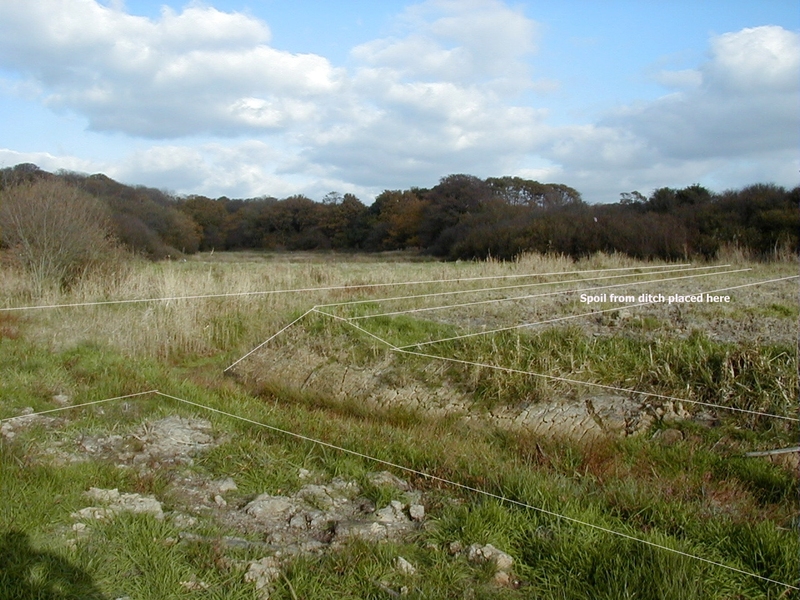 The bank has retained the slurry from the stream that runs south into the marsh and formed a level plain of marsh , which was at one time deep water on the East side and shallow on the West side. Over time the level inside the inlet has risen higher than the main marsh in the background by in the region of a foot. In the recent photo (above) it is now just about possible to see the level differences because the reeds are no longer there. Upon arriving at the site we find that thanks to the excavating equipment the ditch has been cut and expanded to almost half way through the previous earthen structure. Unlike previous excavations, which were probably dug by hand this new ditch is wider, deeper and has removed about half of the previous site of the earthen bank. In many respects I could not have hoped for better since I needed to excavate this site if we were to be able to establish if it had man made construction. This is the view looking North into the inlet after the new drainage ditach has been dug. The line of the ground has been drawn to show the underlying level of ground. About half way across the inlet right at the bottom was a large oak beam or log. In order to evaluate what this might be I decided to start another excavation. First impressions, and being a skeptic in many respects, it looked like a tree buried in mud. However it certainly did not look like it should be there. In order to keep the file size manageable I shall address the issues that the log raise in the next chapter. Having now printed out this chapter and seen what it looks like printed off the web I would really recommend that when looking at these pictures you do so on your web browser. I have decided to use high resolution digital camera images so that you can get a good look at this log. They take some time to load if using dial-up access but in this case I am seeking some feedback from experts out there who may be able to identify the object from previous experience. I have found that these large images tend to pixilate using a standard 600 dots per inch laser printer and therefore viewing via the browser or some other graphics package is required.